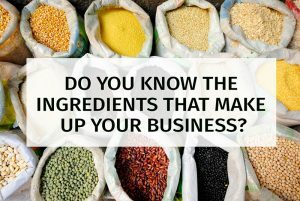 Do you know the ingredients that make up your business? Whatever industry your business is in – manufacturing, food and drink, electronics, retail – it will be made up of a delicate mix of processes and ‘ingredients’. By that, we mean the parts for your assembly line, the actual ingredients in your food products, hardware and software, the products and services you sell on to your customers. Whatever your business sells, you will have your own unique set of ingredients. Depending on the complexity of what you produce, you may have a few ingredients and processes or hundreds and thousands. How can you easily keep track of how your processes are working and exactly what parts or ingredients are being used at any one time? You probably have several in house systems to help you try and gain a clear picture of what is going on in your business. Perhaps you use a stock control system, an accounting system, a CRM? All of these systems are very useful and can usually generate a detailed report on one specific area of your business. But each area of your business is affected by what is happening everywhere else in your business. That one report doesn’t give you a comprehensive overview of how things are working. For that, you would have to create, analyse and compare a multitude of reports, which is not only time consuming, but by the time you’ve finished, the data would be out of date. When you consider what could go wrong when you don’t have the information you need – mislabeled ingredients, undeclared allergens, incorrect parts, product recalls, damage to reputation, fines, loss of profits – the ability to access and analyse the right data in real time can support the smooth running and success of your business. So, how can you get an up-to-date? view of your business? By using a Business Intelligence (BI) solution. A BI solution provides you with access to ALL of your data by cleaning and combining all of your messy data coming from many different sources. Within seconds, it can show you how your processes are working and exactly what parts or ingredients are being used. You can view and explore your data via an interactive dashboard and instantly get the answers and insights you need to make smarter, data driven decisions for your business. You can also spot trends and identify areas where you can be more productive or make savings. It’s easy to create reports in minutes and share with colleagues so that everyone in the business has access to the information they need, and everyone is kept informed and up-to-date. As your business grows and changes, so will the reports you want to create. When you want to report on something new – click and it’s done. You have the flexibility to create reports that show you the information you need, when you need it. And armed with the right information and insights, your business will be more agile, more efficient and can adapt to changes in the market faster. If you would like to find out more about Business Intelligence and how it can transform the way your business works, let’s talk. Call us on 01285 810606 or email jack.wright@yourdms.net and uncover the true picture of what’s happening within your business.